Who Do We make Contact With When Using a Ouija Board? YOU ARE HERE --> Home » Ouija Boards » Who Do We make Contact With When Using a Ouija Board? We were talking about the nature of devices such as Ouija Boards and just who, or what, the entities that are encountered by users are. Are they the spirits or souls of the dead? Are they demons? Perhaps they are interdimensional beings? “I have extensive experience in communication devices. Ouija, Ziriya, pendulum boards etc. I have gained some degree of trust with a couple of these things and they informed me that they are not dead people. They were never people. They were always what they are. And, somehow they have the ability to know intimate things about people thereby convincing them that they are dead relatives or passed friends and such. I shun away from the word demon because they aren�t all so bad but many of them are quite mischievous and will lie in order to convince you of their false identity. And, yes… they will know things that only you and that person would have known. I was asked by the Caretaker to write about communication with these things. I call them things because they told me that they weren’t really dead people. They were always what they are. They can’t give me an age because they said they don’t experience time like we do. Space is linear to them and time is multiple dimensions. That means they can be in more than one place at the same time but they don’t move around in our space so well. That’s why they don’t have form that we can comprehend. Anyway, when I was a teen I used to talk with one that called itself Ziriya quite often. I don’t know if it’s real name is that or it chose it because I was using a Ziriya board to communicate with it. Nonetheless. It was very informative and friendly with me. We used to play board games together. We used to play a game called Rune which was a role playing game but not like D&D. There was an end. A winner and a loser to the game. It was a lot like risk only there was a non-player character which we let Ziriya play. So all the beasts and enemy forces were operated by Ziriya. We would make our moves and actions on the board and then we would get on the Ziriya board and ask what he wanted to do. He would then make very specific and calculated moves. Sometimes we beat him and sometimes he beat us! It was a whole lot of fun especially knowing that we were playing against something not of our dimension. I think Ziriya really enjoyed it too! We had a lot of fun. We then became in some form… Friends. I know this sounds extremely weird but he told us he could speak any language. That communication was in your head and not your words. I realize this sounds weird but it’s all true. He was the one that stopped in mid sentence and told us “Company’s Due” and 2 seconds later someone knocked on my door. No one could have possibly known someone was approaching my door to knock on it! Personally, I find this intensely fascinating, and I am rather jealous I never experienced this ha ha. I don’t for one second doubt or not believe you because, quite frankly, anything is possible in the universe depending on how open your mind is to believe it. I have a question. How does Ziriya speak to you? Is it verbally, mentally, telekinetically, with a board, etc? One more question. Would it be possible for someone else to experience this and if so, how should they go about doing this? 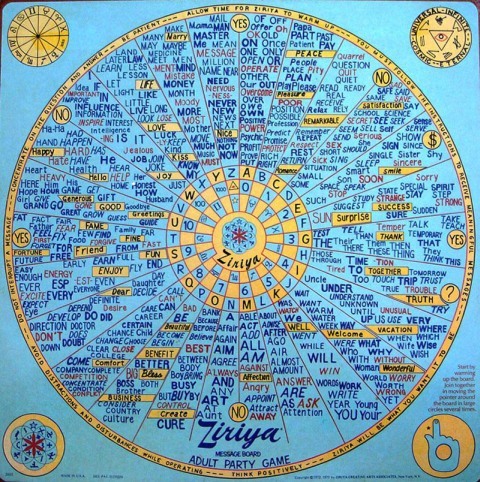 The Ziriya is very much like a Quija Board with the exception that it doesn’t spell things out. It has an extensive collection of nouns verbs and adjectives which allow MUCH faster communication. Ergo, it speaks in full sentences and not spelled out word by word. Very much like the difference between the telephone and a telegraph, or words vs Morse code. The are VERY old but there are MANY still available. They stopped making them in the late 70s but there are several for sale still for 12 to 50 bucks on the internet. I bought one on Ebay about 4 years ago still in the box in mint condition and still have it to this day. The OLD one I used as a teen got destroyed and I missed that thing so much I searched them and and replaced it. Look them up on the web. You at least get a good picture of one and you’ll see what I’m talking about. It’s BY FAR the best communication hardware I have EVER used! I have created my own Mantra, or prayer if you will; for all to chant before you use my style of board communication with goodness. See here is now I see the entire thing, and the entire universe now makes sense to me. I see it all in a metaphysical and astro-physical scientific form… See, Ouija boards are TOOLS that we use to communicate with the dead, right? They were invented by someone at some point for this reason, right? Well, our intent to communicate with the dead has lead to us learning things we should not know if we perform them with malevolent intent like that… What I believe, is that ouija boards manifest creatures that consist of either the essence of good (knowledge) or the essence of evil (ignorance) in the form of what ever they wish to communicate with you (dead grandma, whatever). I believe they do this merely to transfer knowledge that in time will greatly impact your life, if you make the mistake of believing the malevolent ones tricks (demons). I think that turning out the lights and attempting to contact dead spirits and invoking fear and sorrow in yourself merely manifests the raw energy of fear and sorrow from the dimension of the spirit world… I think that these manifestations of energy manifest themselves in our plane of existence through our minds/souls… I think ouija boards, black holes, and newly born organisms create dimensional riffs allowing energy from this spirit world (5th dimension) to inhabit the existence we experience by removing itself from the 5th dimension and entering our world that applies itself to the 4th dimension, Time. This means creatures that have the capability and understanding to commonly live in any place, and any time within a plane of existence we don’t live in, now can manifest themselves and try to control our lives in our dimension of a 4 dimensional world of height, width, length, and time. The energy beings existing within the 5th dimension, do not naturally apply to our 4th dimension bound by time. I believe the energy within the 5th dimension ARE WHAT WE EXPERIENCE when we open our minds to that energy, by trying to contact the dead. I believe that, this dimension possesses a pool of energy and the essence of knowledge (good), or evil(ignorance) that inhabit all things in our world, and theirs. Socrates- “The only good is knowledge, and the only evil is ignorance.” I think that merely what matter/energy that is preserved in the 5th dimension, lingers until it is sucked back into our 4th dimensional existence through rebirth, ouiji boards, or possibly shamanistic trance journeys with DMT inhibited ayahuasca drink. VERY NICE picture of the board ! ! ! ! Yep . . . That’s it ! ! Good hardware if you use these things! That picture REALLY makes a good addition to what I was talking about ! ! My sister once told me that my oldest sister played with an Ouija board a long time ago with a friend..and that friend of hers started puking up blood. I got scared when I heard this story, I don’t know if its true I never asked my oldest sister if it was. Can anything like that happen when it comes to using these boards..? The risks are that you are going to INVITE things that think for themselves into your life. Some are really nasty and some aren’t so bad. I’ve only met ONE that was actualy befriending to me and that was the one that went by the name Ziriya. Like I mentioned, not sure if that’s it’s real name or it chose it because we were using a Ziriya board. Didn’t matter. If you start using these message boards YOU WILL invite these things. They WILL most likely come. I had the benefit of one of these things warning me and actually stopping some of these malevolent ones from doing their thing. The best thing it ever told me was to NOT believe a word they say. Be smart and realize what you’re REALLY talking to. It’s NOT GRANDPA, OK ! ! ! ! They will KNOW things about things that NO ONE could possibly know and be VERY convincing that they are who they claim to be. Trip them up and ask their names over and over. Pretty soon “Grandpa” will start calling itself a whole lot of other names and have a quick change in personality! Been there . . . done that a BUNCH ! ! ! ! As far as Physical attacks are concerned. I did have something warn me about crashing a motorcycle once. It DID happen soon afterward. I can’t honestly say whether it was influenced or that I was simply warned. Never seen the scratches and wounds commonly reported but HAVE seen MANY MANY paranormal events and had very personal contact for many years with these things. I personally have had what I guess is called psychic attacks but never physical attacks. Dealing with these things can cause you to be influenced in doing things you would not normally do that causes problems with family and friends. Don’t know why they do this but it is VERY common for them to do such. That’s one of the reasons I am so glad I found this site. I see a whole lot of people here in the beginning phases of their relationships with these things. Just remember, HAVE NO FEAR AT ALL and don’t believe a word they tell you until it is verified. Just have fun with them and BE SMART ABOUT IT! Actually, HAI . . . . I guess I could say I’ve had a couple of physical attacks but there was never an injury and real harm done to me. I had something pop up and hold me down in bed. That would probably be considered your regular sleep paralysis type event. AND, I’ve had something try to pull me off of my bed. The later was when I was younger and it scared the crap out of me so much that I JUMPED all the way to my bed room door and ran outside the house IN MY UNDERWARE ! ! LOL ! ! ! ! It took a long time before I recovered enough to realize I CAN’T stand outside in my underware all night so I went back inside and slept on the couch. Nothing bothered me the rest of that night but I must admit I slept very lightly. There most likely WILL BE things start to happen. Be very vigilent about people being upset and relationship troubles that seem to come from nothing at all. They are the influences that these things seem to like to do. The ultimate answer is that I have not personally been physically harmed nor do I know of anyone else that has. BUT, I DO recognize their meddling in my life. what should i do before using an ouija board and after using one ? I’ve heard that you have to light up white candles because its like a protection spell , doesnt that just welcome the demons or whatever it is even more ? Sorry if im asking too many question. Well, jeff, I have an Ouija board and I’ve really never used it. How DO I use it ? What do I do to get started ? And this “ghost” stuff you talk about, is it actually real ? I don’t know for SURE of ANYTHING that wards them off. There are as many rituals and such as there are self proclaimed psychics and people like us talking about paranormal events. The best way I can think of is to never invite them in the first place. That’s no fun though, huh? I’m not a big believer in rituals and spells and the like because all that stuff is just invoking another one to do something on your behalf. To me, I’d just as soon go directly to one and bargain the the act out personally. At least then I have an good idea of just what I’m dealing with. There will be people tell you a bunch of different things to say, burn or wave about. Those things are untestable and if nothing happens you can’t test it to find out whether or not THAT ritual warded them off, they just want you to think it did, or they just weren’t that interested and didn’t manifest themselves. If someone gave me a solution to put in my fuel tank to improve gas mileage . . . I can TEST the validity of that. It’s sort of like riding a roller coaster for the first time. Someone can tell you different things to do to either relieve anxiety or even have more fun with the ride but you’ll never REALLY know until you’re on the thing and there’s no getting off after that. There are a few things that you can do for yourself though. That is to be absolutely absent of fear. That’s hard to do in the beginning but it comes easily with more and more things happening around you. I have been lucky enough (I suppose) that pretty much everything I’ve simply stood up to and TOLD it to stop or go away . . . They did! It or something else always came back later but I can’t tell what the cause and effect was because at the point when they started bothering me like keeping me up at night and such I had already lost my fear of them. So I can’t say for sure but I KNOW having no fear of them is a good thing. In other words I don’t know if they’ll go away if you tell them to while you’re shaking in your socks from stuff flying around the room or not. I’ve never tried when I was fearful of them. And I don’t know if the ones that I’ve encountered were just playful poltergeists. It’s hilarious to me to listen to people argue about this or that spell or ritual or just exactly what these things are. It’s like watching people arguing over what what form a cloud in the sky is TRULY representing. You can say what you believe and you can SWEAR it’s the truth and tell everyone else they don’t know what they’re talking about but you can’t test it and you can’t prove it to someone else. The other thing is that those who believe they KNOW the facts about it all get VERY passionate when you question them. It’s all circular reasoning until something can be tested. I have never done anything to ward them off but yell at them to “cut it out! ! ” and such and it seemed to work for me. They always came back a few days or weeks later but I didn’t want to stop them unless they were bothering me in some manner. Actually, one WAS rattling the door knobs in the living room every time I or my wife would go into the back office. That got annoying and I told them to cut it out and they wouldn’t. That also involved my wife so maybe if we both had told them it would have stopped. . I don’t believe Angels SERVE us by request especially when we are inviting these other things in. Don’t get me wrong, Angels are very real but I believe they have a preordained “JOB” to do and running errands for US like chasing demons off that WE INVITED probably isn’t part of that job description. All I can tell is try some of the things people tell you. Personally, I’ve got nothing because from what I’ve learned is that those spells and rituals are simply invoking another one to perform an act. Maybe they will . . Maybe they won’t. I never worried about it. I didn’t want to stop them nor ever experienced terribly harmful demonic interaction so I didn’t bother keeping them out. Heck I kinda liked their antics. It was a HOOT when they did this stuff in front of other people and they saw it for the first time. Oh, one other thing. Not ALL interaction with these things are physical manifestation. Those are just the fun ones. Watch out for family members, associates AND YOURSELF exhibiting sharp changes in behavior. Usually irritation, anger or mischief. They will influence negativity into your life and disrupt relationships and such. There is a case posted on another post on this sight about someone having an experience and the next morning a family member threw a FIT for no apparent reason. I’m not mentioning who and where this is because It’s a little personal to them and they have a completely different belief in the reason for this happening. So like I mentioned in the previous response, they’re likely to get REAL agitated and argue. I’m NOT here to argue with people about unknowable things. But, that is precisely the type of changes I am talking about. They can be very subtle too. You’re girlfriend just starts being annoyed at you continuously making the relationship hard when nothing new about each other has been presented. 1. You say that they told you they were not humans and never were humans. Did they ever tell you what they were? If not, what was their reasons for not telling you what they were? 2. Is Zakirya the only one you’ve talked to? Were their others that you’ve talked to? 3. What did Zakirya call those other entities that were “malovent”? 4. Did the entities you communicate with tell you where they were located? Did they ever describe their environment to you? 5.Did they ever tell you that human spirit communication was impossible? Just a few questions I have for you. Answer them if you will. Thanks..
Occultic communication devices such as the Ouija, Ziriya and pendulum boards can be considered wicked devices. From the dawn of time, men have been creating such devices to connect them to other spiritual dimensions where terrible and cruel spiritual creatures exist. The bible condemns these boards because they open portals to the abyss and unleash hell on earth in form of powerful malevolent beings. Psalm 37:7 – Rest in the LORD, and wait patiently for him: fret not thyself because of him who prospereth in his way, because of the man who bringeth WICKED DEVICES to pass. Proverbs 12:2 – A good man obtaineth favour of the LORD: but a man of WICKED DEVICES will he condemn. Proverbs 14:17 – He that is soon angry dealeth foolishly: and a man of WICKED DEVICES is hated. These wicked devices open or access other dimensions and places on earth that the bible calls the bottomless pit. The word of God states these places where these fallen angels or devils reside are called the Habitations of Cruelty. Once these wicked devices are used to open portals for these fallen angels or devils to enter our third dimension, their next step is to secure a host or a body to operate from in this dimension. Demons are spiritual creatures and they do not consist of flesh and blood. They prefer to dwell in and operate from humans or animals. When cast of out of a person they wonder the dry places or spiritual realm before returning back to their previous human host. They always need a physical form to control even if it is swines. Luke 11:24-26 – When the unclean spirit is gone out of a man, he walketh through dry places, seeking rest; and finding none, he saith, I will return unto my house whence I came out. And when he cometh, he findeth it swept and garnished. Then goeth he, and taketh to him seven other spirits more wicked than himself; and they enter in, and dwell there: and the last state of that man is worse than the first. Mark 5:12-13 – And all the devils besought him, saying, Send us into the swine, that we may enter into them. And forthwith Jesus gave them leave. And the unclean spirits went out, and entered into the swine: and the herd ran violently down a steep place into the sea, (they were about two thousand;) and were choked in the sea. Anyone who plays with the Ouija Board have broken God�s commandments by contacting devils and thus they have open up themselves to a whole heap of trouble. These same devils now have legal right to possess, torment, afflict, kill or use them as they see fit. The reason why the demonic spirits know so much about people and the universe is because they existed before time and space were created by God. These spiritual creatures were present when God created the earth and humanity. Job 38:4-7 – Where wast thou when I laid the foundations of the earth? declare, if thou hast understanding. Who hath laid the measures thereof, if thou knowest? or who hath stretched the line upon it? Whereupon are the foundations thereof fastened? or who laid the corner stone thereof; When the morning stars sang together, and all the sons of God shouted for joy? Mr. Stone is correct when he stated that the things he communicated with are not dead people because the dead cannot interact, watch over or communicate with the living. Ecclesiastes 9:10 – Whatsoever thy hand findeth to do, do it with thy might; for THERE IS NO WORK, NOR DEVICE, NOR KNOWLEDGE, NOR WISDOM, IN THE GRAVE, whiether thou goest. Ecclesiastes 9:5-6 � For the living know that they shall die: But the DEAD KNOW NOT ANYTHING, neither have they any more a reward, for the memory of them is forgotten. Also there love, and their hatred, and their envy, is now perished; neither have they any more a portion forever in any thing that is done under the sun. These devils that communicate with people through the Ouija board and other devices are deadly. They have nothing to loose because they are slated to be destroyed for trying to kill God, their creator. The bible states that these devils or gods will perish from the earth. Jeremiah 10:11 – Thus shall ye say unto them, THE GODS THAT HAVE NOT MADE THE HEAVENS AND THE EARTH, EVEN THEY SHALL PERISH FROM THE EARTH, and from under these heavens. Revelation 20:10 – And the devil that deceived them was cast into the lake of fire and brimstone, where the beast and the false prophet are, and shall be tormented day and night for ever and ever. really.. i will not give you ANY false information but listen to this.. there are no good spirits that WILL TALK TO YOU ON THE OUIJA BOARD……. because the ouija board is a occult item…. and im sure they don’t predict the future ONLY GOD’S prophet can predict the future 100% or GOD HIMSELF not some spirit. every spirit you talk on the ouija board are evil they list down ALL your sins and use them against you they will say they are good but they are dragging you AWAY from GOD so you actually trust in the spirits and not GOD’S which is what they do.. evil spirits takes you away from GOD they destroy you from inside…. also another note that dream catchers or any other good luck charms out there .. have you EVER WONDERED WHY. there is a hole on the middle… ANSWER=because to defeat an evil spirit.. you have to have a STRONGER EVIL SPIRIT which is why it is never good luck.. I know a story of this guy went to our school’s priest..(I asked him all this questions he really knows alot) he said. he has this reoccurring nightmare . then all this and that then he slipped and said that he bought a dream catcher from baguio(a place) and thats when he explained the purpose of the dream catcher. he threw the dream catcher away and his nightmare stopped. K. Smith, I’m very impressed with your knowledge and use of the various books in the Bible. I’d mention that “scrying” and necromancy are also sure to bring one supernatural trouble. The best way to avoid dealing with these beings is to never invite them into your home, or your life. If you don’t know what the word “consecrate” means, you should take time to look it up. Essentially, one dedicates and consecrates their life to a particular Diety, or service for the duration of their life. It is not unlike making a covenant with God. God does not sleep, and nothing escapes His sight. Biblical truth is a source of learning to trust God, and to grow up into mature believers. Revelation of Biblical truth does not happen all at once. It comes with age and experience in Christ. Only God Himself chooses what and how much one can bear, and He will not put more on us/his children, than we can bear. Peter, a disciple of Jesus Christ was put to the test, just as Christ foretold. Peter later became an Apostle of Christ. Check your Bible. Peter denied knowing Christ three times immediately before Christ was crucified. I believe Peter did a lot of growing during those last few days spent with Christ, and following the Ressurection, he grew so much more, and discovered what spiritual growth is all about. Instant Apostles do not exist. I mean no harm to anyone here, and I’m a firm believer in differing opinions, and also a firm believer in respecting the opinions of others even though you may completely disagree. I have no idea though. I know I have a strong belief in God alone, no middleman for me. Coming from a staunch ex-atheist, I guess that’s a step in the right direction huh?!! This is what I think. My two cents. I hope I haven’t offended anybody else’s belief system as I did not intend to do so. Thanks to Caretaker who is doing such an amazing job with this website. If it wasn’t for him, I wouldn’t have met so many great people and I wouldn’t have half the answers I’ve been searching for since I could speak my first word. Thank you, CT. I have had a similar encounter with an entity named NOME. Don’t ask, but I have communicated with “him” for almost 10 years now and nothing negative to account for. I have also had experiences that all I can say is “mimiking” not a negative mimic but where they would say they were passing messages on to me from departed ones..not that they were impersonating them. I have not had a negative experience and like Jeff I guess he is a sort of friend. Can’t explain it. I do not believe Ouijas to be evil. I think it is sometimes the intent of the person using it. Evil attracts evil. I was also not afraid, but I have noticed they “test” you. Sounds insane but unless you have been there it is pretty weird to explain. I consider myself an expert on the boards after having used them so long. I believe also in the fact that you can communicate with the living using them.. which is something for another day and time. Just had to comment…take care. Look guys . . . . This is REAL EASY. Except for all the ghost media hype. There are the “things” that ARE for lack of a better term “living” with us. These things are NOT all evil. Many ARE. The ones that aren’t evil seem not to be as vocal as the ones that are. Look. I can’t explain this. I just know that I lived many years dealing with both. Mostly the malevolent. You people can take this or leave it. I’m really getting tired of getting slammed for my good advice. I have spoken and lived with these “things” for many years. When I started coming out and telling people about them they seemed to go away. You make your own judgments, but, I’m telling you and WARNING YOU that they will claim to be your dead relatives and I have seen them in their true form and they are NOT HUMAN. Never have, never will be. Go out and do what ever you decide. HERE IS MY WARNING. When you are no longer in awe or question of them they will go deep into your sub conscience. They will make TERRIBLE things happen in your life without you knowing they are responsible. It’s ALL fun and games until you realize they are BAD NEWS! Then they stop playing and start harming REAL things in your life. Many people have been committed to hospitals because they thought they were mentally ill but there was a demonic presence driving it. Hurting their family and themselves. I AM NOT A RELIGIOUS PERSON ! ! I Am NOT A BIBLE THUMPER ! ! ! I am someone who lived with these things and invited them into my life because it was entertaining and then years afterward I learned most of them were NOT what they claimed to be! ! ! Heed My warning! No matter how careful you are about how you filter them . . . . . . The wicked WILL get through! ! ! I know ! ! ! Personally ! ! ! In all honesty, I don�t visit TrueGhostTales anymore but your post caught my attention. I see that you still want to use the Ouija Board, yet you want to know how you can stop the demonic spirits from tormenting and attacking you. Firstly, you have already opened a spiritual doorway in your life. Secondly, the demonic spirits already has legal right to torment you because you went seeking them out and thirdly, if you continue to seek them out via Ouija Board, then they will continue to afflict, torment and attack you. The thing with demons is that once they show up they don�t want to leave, and they only leave when you call Jesus Christ. Therefore, the only person who can help you at this time is Jesus Christ. What you talk to is a demon.A yucky,mean,crude,cruel,twisted demon.NEVER play with I ouiji board.Doing so can result in possesion,madness,death,or worse.Don’t take it lightly. Interesting that Jeff’s friend on the board will tell hom not to believe any other spirit because they are lying to him but he believes this 1 spirit wouldn’t lie to him?? Sorry but that doesn’t make any sense at all to me!!! Steph, I read your logic and IT IS SOUND ! ! However, What most didn’t get was that I spent YEARS with this particular Demon, Spirit, Guide . . . . Call it what you will. In the event of encountering MANY MANY others Ziriya has been pretty trustworthy and SURE . . . He may well be a Demon with bigger and smarter plans than the rest . . BUT . . what it DID reveal was worth a whole lot of the risk and weirdness and some of the torment. Personally, I never found a connection between the ENTITY, Ziriya, not the board, and what we would call Evil. He was my friend, but I haven’t heard a word from him in years. Jeff, In no way am I trying to condemn or disclaim your usage of the board. I do feel that these boards are not games and can and do have devastating effects on people and their lives. Im just tryin to understand how u could believe this one entity whole heartedly and even to consider him to be your friend! Why have u not spoken to him in such a very long time? And what do you think his motives were to talking with you and telling you of the other spirits on the board? I’m 43 years old now and the last time I heard from what I KNOW to be Ziriya was about 20 years ago. One thing I have noticed about this site is that there is a OVER abundance of religious zealots posting. I’m not real clear WHY this is but I have a message for all you. First of all . . . WHY are you here in the first place if you think all this is so evil. Do you REALLY think you are “fighting” evil by email? Secondly. . . . Look, “THE CHURCH” has been responsible for placing NUMEROUS well respected medieval scientists in prison, house arrest and even to DEATH for sharing what WE ALL KNOW NOW to be A FACT ! ! The UNIVERSE is FULL OF LIFE ! ! ! Just because this life doesn’t take a carbonaceous body such as you and I DOES NOT by default MAKE IT EVIL ! ! ! Heck for all we know WE are the rarity in forms. We ourselves may very well be the LOWER forms of life that the UNIVERSE has created. These other forms of life ARE REAL and seem to be multidimensional BEYOND our normal field of perception. MY GOD ! ! ! ! (pun intended) What are you going to say to God Himself when he isn’t a HUMAN !? Are you going to call HIM EVIL? You OWN CREATOR ! ? It is in the interests of science and OUR well being to discover and IDENTIFY the various OTHER forms of intelligence in the UNIVERSE. Just because the dogma or the common paradigm feels that other forms of life MUST be living on the dirt surface of a planet somewhere JUST LIKE US does NOT MEAN that it is the ONLY form that is accepted as intelligent! I personally have been in contact with THINGS that I do NOT understand but have beyond a doubt proved themselves to be free thinking self entities! Whatever they are they are a FACT and WE need to put aside our DARK AGE attitudes and approach them as they have ALREADY BEEN APPROACHING US ! ! ! ESPECIALLY IF THEY ARE EVIL ! ! To hide your heads in the sand and say, If I don’t LOOK they don’t exist” OR to “I’ll wave my magic wand or religious talisman and overpower them!” IS RIDICULOUS ! ! ! That’s like saying If I don’t acknowledge the big giant DOG that is about to BITE me isn’t there then he doesn’t exist ! ! ! OR If I show that Big attacking DOG a cross he won’t BIT ME ! ! ! Bacon Sandwich ! ! that a polite way of saying YOU ARE STUPID ! ! ! As an example . . . .
Madam Curie AND her husband BOTH DIED of radiation poisoning. It was an INVISIBLE and MYSTERIOUS energy to the world. Does that MEAN that Ionizing radiation is EVIL? NO . . . . It just simply means that the PIONEERS in the fields of something COMPLETELY unknown must take the RISKS of discovery! Then when information is established the REST of the WORLD (mankind) will KNOW how to handle this previously unknown and mysterious entity! I personally think Ouija boards are bad news. I say this only because someone convidence me to use one when I was having a difficult time with an evil entity because a priest with catholic church refused to help me the second time the entity came back even more fiechy than before. What came through it the very first time I used it was more trouble and fighten as what I was already dealing with. My whole family and friends suffer for what I allow to come into my life. It didn’t matter what age or gender the person was. My sister who by the way didn’t know that I was using one had the misfortune of being follow home one night after her and my 4 yr old nephew visited me. I was completely at fault for this and regret what happen. So please think real hard before using one. What comes through that board is powerful and dangerous if you don’t be careful.